As you may recall, I recently wrote an article about why being able to create PDF files and convert PDF files is important to a blogger. I had started thinking about this because I am about to do a mini redesign for my blog and I would need to alter my media kit to coordinate with it. This would be fine if I wanted to leave the media kit in a Word document format, but I would very much like to have a PDF version because it does look much more professional. So my dilemma was (and still is) about my struggling to decide if I could spend the money on PDF software. Money is tight right now, so can I really justify the expense? Well, this free PDF trial might be a solution for anyone in my situation. 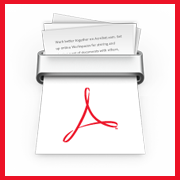 One of the benefits of the free trial is that it offers you 5 free PDF conversions. You are required to register with your name, email, password, age, and geographic location. Has anyone tried this free trial before? I am curious to know if there are any other requirements aside from the registration. If not, this would be perfect if you have a specific one-time project to complete.